Financial Modeling Best Practices - Guide of What You Need to Know! 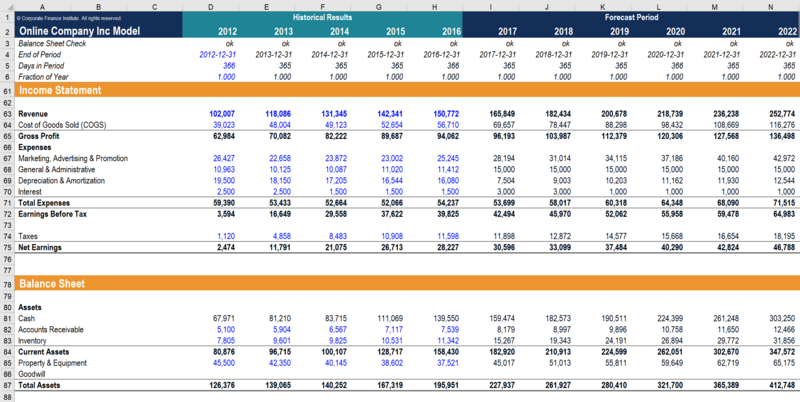 This guide will provide readers with information on financial modeling best practices in an easy to follow, step-by-step guide on how to building a financial model in Excel. These tips are adapted from CFI instructorsMeet Our TeamCFI instructors are industry experts in finance, accounting, investment banking, FP&A with extensive experience delivering analyst training program at global banks. Meet CFI's team of faculty, advisors, and operations staff. Learn financial modeling and valuation with online courses and certification programs. with over 15 years of financial analyst training experience. In modeling, it is crucial to apply a structured approach – a robust model contains three core building blocks: inputs, processing, and outputs. It is important to note that the inputs must be clearly separated from the processing and outputs of a financial model. Inputs should at all times be clearly defined and only be entered once. The processing of inputs to outputs must be not only transparent but also must be broken down into simple steps that are easy to follow. Finally, outputs should be well organized, so users have quick access to the outputs they wish to see or use. Before we examine the building blocks and financial modeling best practices in Excel, it is important to note that model building is not an iterative process. In fact, models that are built on the fly without scrutiny or attention to detail are typically prone to errors. What problem is this financial model designed to solve? What are users supposed to do with this model? What is the minimum number of inputs and outputs required to build a useful model? Plan how the inputs, processing, and outputs will be laid out. Try to keep your inputs in one place as possible in order to have a quick overview of all inputs and their impacts on the model. In model building, inherent tensions create a spectrum of models, ranging from realistic to robust. While large and realistic models offer users a high degree of detail and precision, due to their complex nature, they are also more challenging to build, follow and audit. On the other hand, small and robust models are generally easier to build, follow and audit, yet lack the degree of precision necessary for decision-making. The best financial models work to reconcile these opposing forces, hence keeping inputs and outputs as simple as possible, while still providing sufficient details for decision-making. Your model should be structured so that you should only enter each data once. Moreover, all inputs should be differentiated from the outputs by using different colors, highlights, and fonts so they are easily identified. Yellow shading or blue color fonts are often used to indicate inputs. Finally, it is important to fully utilize existing Excel tools to ensure data integrity. You could use data validation, conditional formatting and comments to help you maintain the integrity of your data and model inputs. Image from CFI’s Financial Modeling courses. Financial model outputs include balance sheetBalance SheetThe balance sheet is one of the three fundamental financial statements. These statements are key to both financial modeling and accounting. The balance sheet displays the company’s total assets, and how these assets are financed, through either debt or equity. 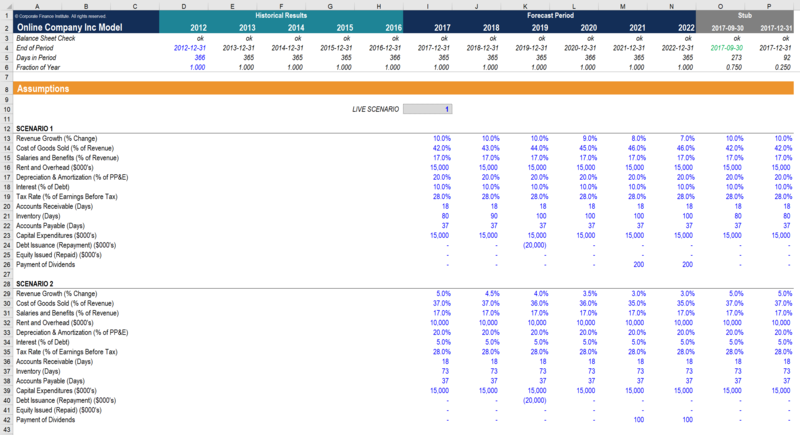 Assets = Liabilities + Equity forecasts, cash flow forecasts, DCFDiscounted Cash Flow DCF FormulaThe discounted cash flow DCF formula is the sum of the cash flow in each period divided by one plus the discount rate raised to the power of the period #. This article breaks down the DCF formula into simple terms with examples and a video of the calculation. The formula is used to determine the value of a business valuations, and so on. To learn more about DCF valuations, please see our Business Valuation Fundamentals course. Make outputs modular so the end users can choose which outputs they wish to review. 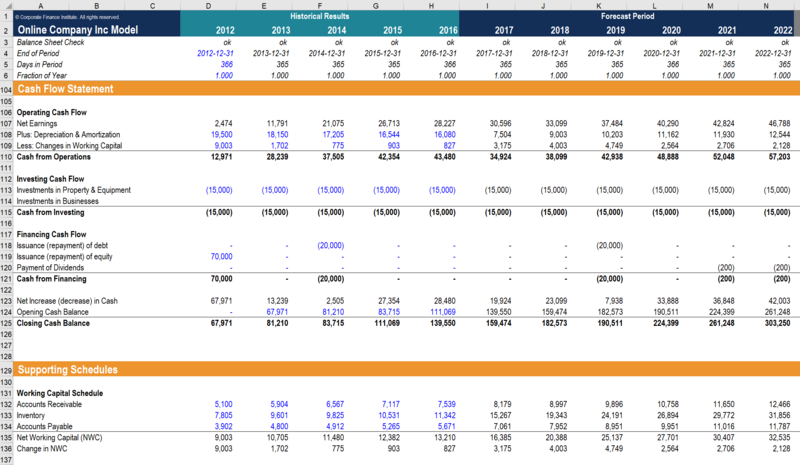 For example, one can keep the balance sheet, income and cashflow forecast in separate groups or worksheets. Consider creating a summary output sheet that allows users to review the key model outputs without having to go through the entire model. Utilize colors to clearly categorize and indicate output formulas and cells. Consider protecting your output cells and worksheets to maintain data integrity. Source: CFI’s Financial Modeling courses. Watch this short video to quickly understand the main concepts covered in this guide, including the key structure of model building, best practices in financial modeling, and the different sections of a financial model. Thank you for reading this guide to financial modeling best practices. CFI is the official provider of the Financial Modeling and Valuation Analyst (FMVA) designationFMVA™ CertificationThe Financial Modeling & Valueation Analyst (FMVA)™ accreditation is a global standard for financial analysts that covers finance, accounting, financial modeling, valuation, budgeting, forecasting, presentations, and strategy. .